After a heart-breaking pair of losses to Solomon Islands ended their 2018 FIFA World Cup Russia™ hopes on Tuesday, the Papua New Guinea Kapuls have returned to their respective domestic clubs for the Papua New Guinea National Soccer League, resuming this Saturday after a three-week recess. The semi-professional competition was put on hold to allow the Kapuls time to focus on the OFC Stage 3 encounters. Lae City Dwellers coach Peter Gunemba is pleased to have four players return from their national duty but after their valiant effort for the national team over the past few weeks, he has given them the option to focus on recovery before returning to their club commitments. “We’d like to have them play but we’ll give them the option of resting up if they want to after playing for the Kapuls,” he said. 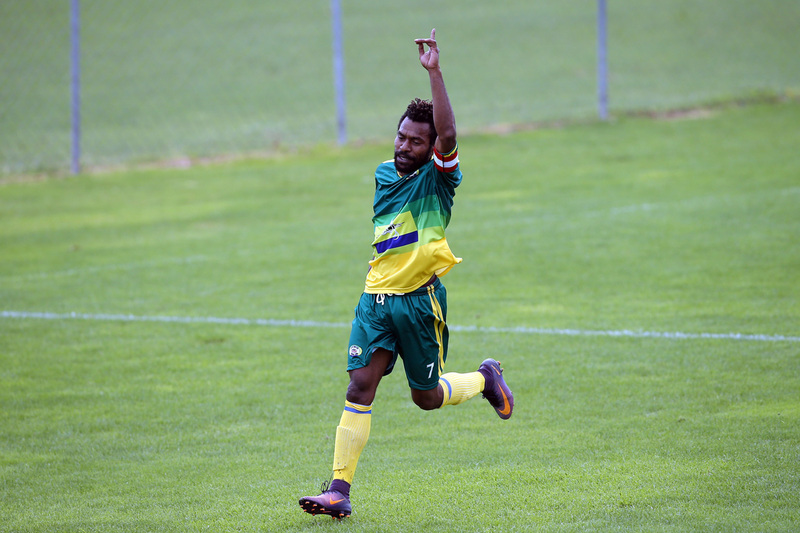 “We understand that those two losses to Solomon Islands were tough on the side, especially with them travelling and playing two international matches in five days so we’ll let the players decide if they want to play,” Gunemba said. The decision lies in the hands of Obert Bika, Emmanuel Simon, goalkeeper Ronald Warisan and Raymond Gunemba. The latter – Peter Gunemba’s son – will most likely choose to take the field this weekend, having made himself available for Lae City Dwellers despite injury or busy national team schedules several times in the past. Gunemba senior expressed his pride in the players after their historic World Cup qualifying campaign and assured that their commitment to the side and country will not be questioned regardless of their decisions this weekend. “We were hurting – as I’m sure other Papua New Guinea fans were – for the Kapuls and we felt for our four players after Tuesday’s loss,” Gunemba said. With the remaining players in his squad showing strong performances in training sessions throughout the recess and a three-for-three winning streak in the league so far, Gunemba is feeling confident about the ability of his side – with or without their national team players – as they prepare for their fourth fixture of the season against the enthusiastic but inexperienced U-21 development team PNG Besta United. “All our players are in good form and healthy and after three weeks off they are hungry to play,” he said. Lae Ciy Dwellers will play PNG Besta United at 12:30pm on 17 June at the PNGFA Academy in Lae following the clash between Madang FC and Buang FC at the same venue at 10am. Yamaros FC and Huaweii FC will also meet on Saturday, playing at Bisini Soccer Ground at 3pm in the first clash of the 2017 season played in Port Moresby.